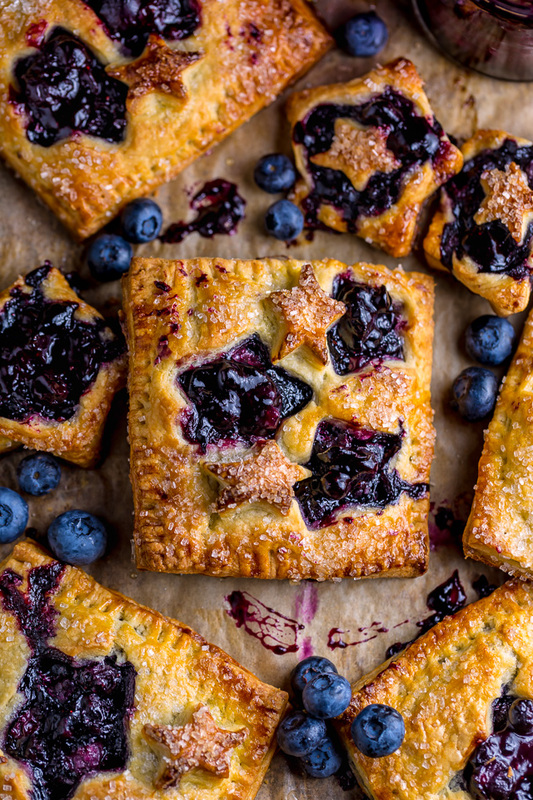 These Blueberry Bourbon Hand Pies are so easy and a total showstopper! 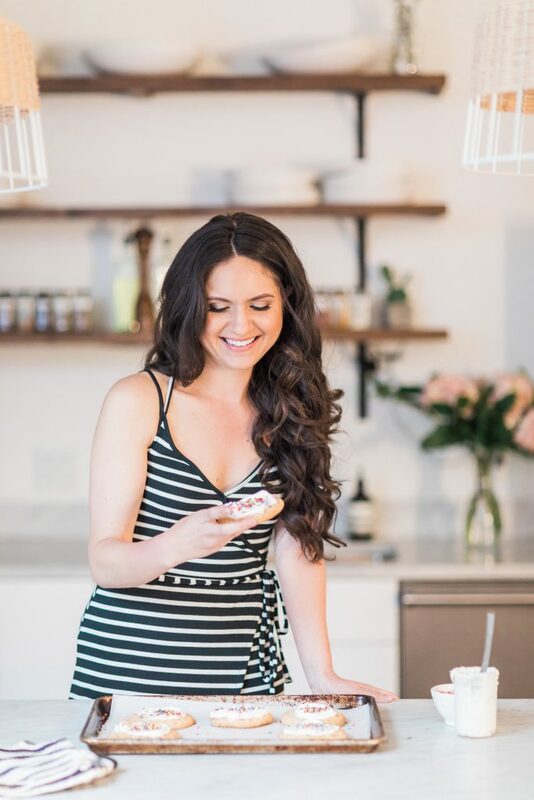 You have to try them this Summer! Hello and Happy (almost) 4th of July!!! You can use any brand of bourbon you want. We use bulleit because it’s what we usually have on our bar cart. Because it needs to chill, you should make the crust first! And be sure to plan ahead time wise. The good news is this crust can be made up to 3 days ahead of time and stored in the fridge until needed. Be sure to let the blueberry filling cool down a little before adding it to the crust. It doesn’t need to be cold, but should be around room temperature. Hot filling will melt the butter in the pie dough, which will result in a less flaky and possibly soggy crust. You may use fresh or frozen blueberries for this recipe. If using frozen, no need to thaw them first. When it comes to the shape of your pie, you have options! If you want them star shaped (or any shape, really), use a cookie cutter. If you’d like your pies to be square, you can use a pizza wheel to slice the dough into rectangles. I’ve included full instructions for both methods in the recipe box below. 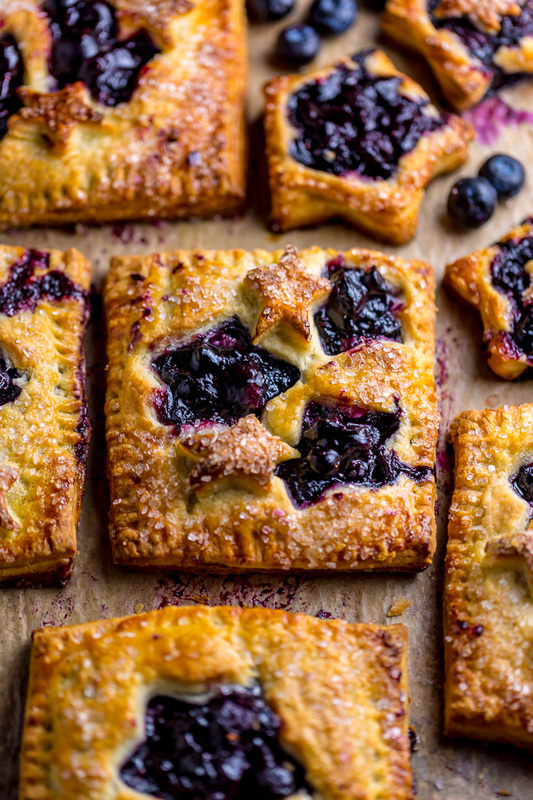 No matter how you shape your blueberry bourbon hand pies, be sure not to overfill them. You really only want to add a hearty tablespoon or two (depending on the size of your pies) of filling to each pie. Too much filling will result in soggy hand pies. 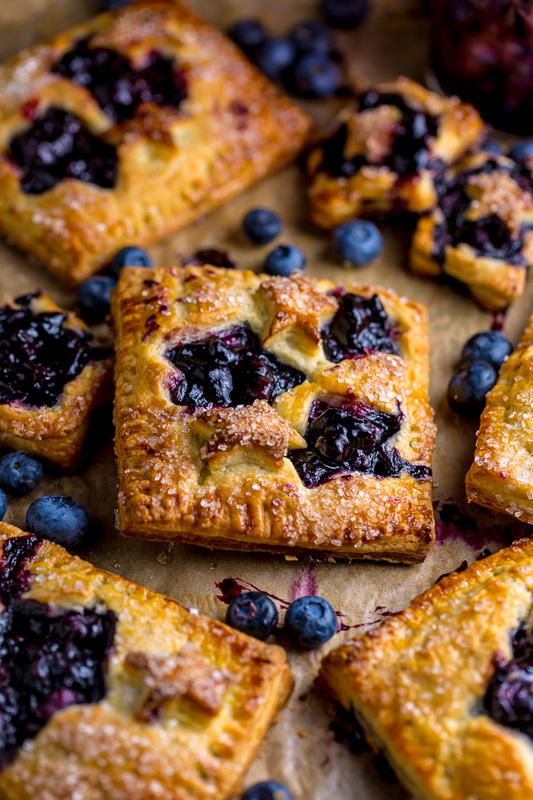 Boozy, fruity, flavorful, and flaky… these blueberry bourbon hand pies truly have it all! Wishing you a safe and happy 4th of July 🙂 I’ll see you next week with CAKE. 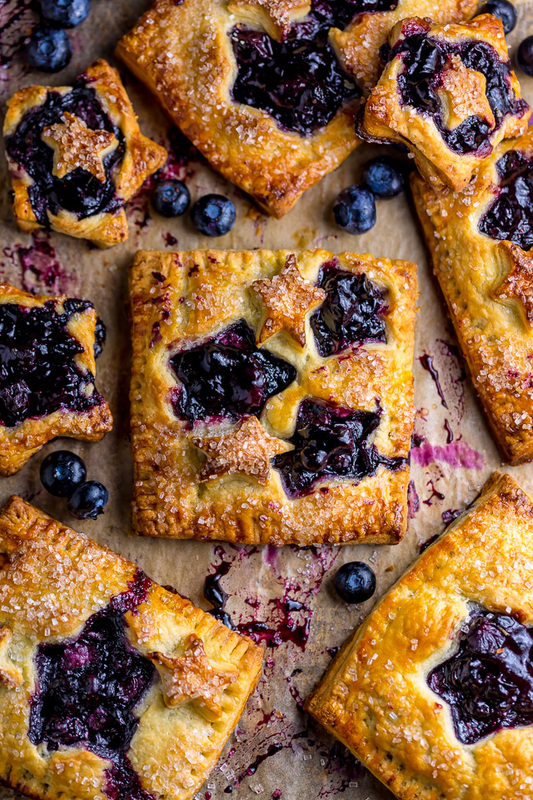 Boozy, fruity, flavorful, and flaky... these Blueberry Bourbon Hand Pies have it all! Add the butter, working it in with your two forks or a pastry cutter, until it's a coarse meal. The butter should still be in large, pea-sized pieces. 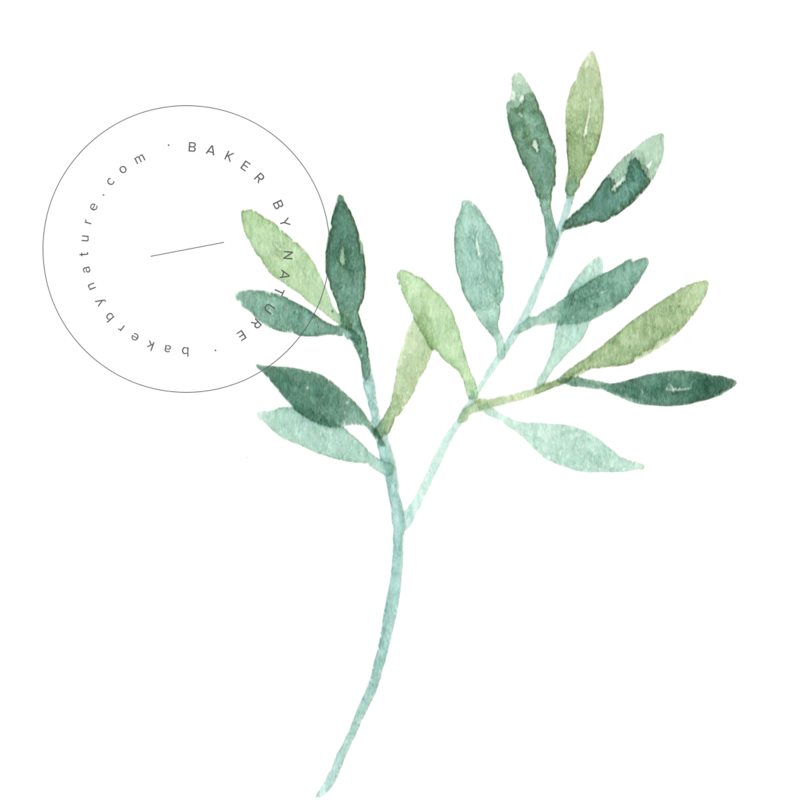 Combine all of the ingredients in a saucepan; bring to a simmer over medium-heat. Cook, stirring frequently, until the mixture starts to thicken and coats the back of a spoon, about 6 to 8 minutes. Transfer the blueberry filling to a bowl and let cool to room temperature. Roll the dough into a large square, about 16" x 16". For square pies, use a pastry wheel or pizza cutter to cut out sixteen even squares. For shaped pies, use a large cookie cutter to cut out an even amount of shapes (the amount of pies you will get will depend on the size of your cookie cutter). Divide the filling among eight of the squares (or half of the cutouts), using about two tablespoons for each. Brush a little bit of the beaten egg wash along the edges of each filled square. Using a small knife - or small cookie cutter - cut a vent into each of the remaining squares. 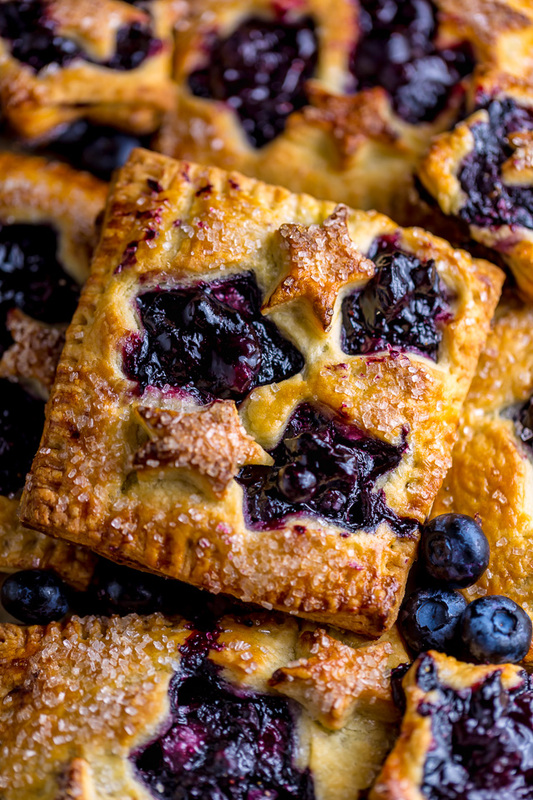 Top each filled square with a vented square, and press along the edges with a fork or a pie crust crimper. Make sure the edges are sealed well!